Comb Ridge, UT: Mark and I were able to slip in two new routes while clouds were rolling in from the west yesterday (3.31.2006). The first route we did we called Beer Goggles & Binos, 5.10. Mark began the first pitch to the right of the main corner which involves a fifty-foot traverse. I headed up the corner about 85 feet to a ledge inside a chimney. The gear (in order, Camalots): #2, #3, #4, #1, #2, #1, #1, .75 X many, .5 and a #1 and/or a 4.5 for the top is helpful. Next, Mark ascended a fun crack/seam/face/flake up 95 feet and established an anchor. The route requires some tricky gear placements, ranging from a #4 Camalot and thin wires down low, to hands and .3 Camalots in the flake up high. Reaching the anchor, from exiting the flake, is the most committing move on the route. 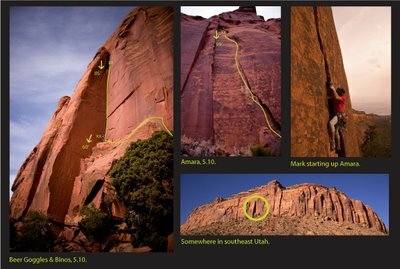 Mark named the route Amara, 5.10 (PG 13). At the end of the day, just before the rain began, Mark and I took a walk along the cliff base just to get an idea of future projects. There were several thin finger corners and a few hand and OW sized routes to be done. photo: Mark starting up Amara, 5.10 (PG 13), placing a #4 Camalot.